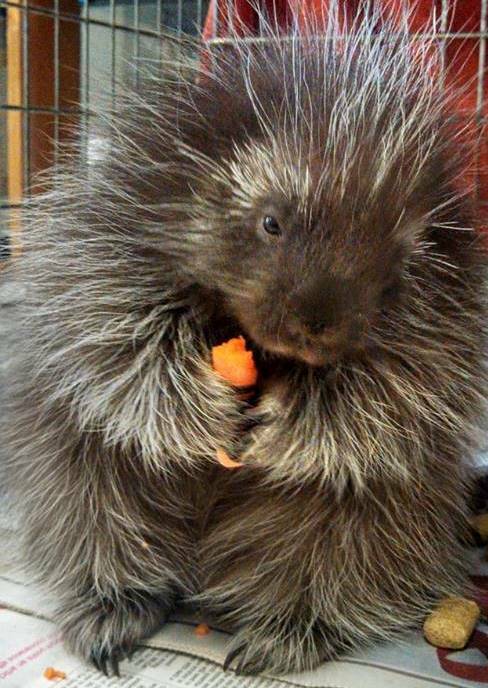 We care for one or two porcupines each year. They arrive at the clinic hit by cars, suffering from mange, or having fallen from a tree. They are certainly a challenge to treat, having quills that, although not capable of being “shot”, do enter skin easily and they really HURT. Porcupines also have a unique “aroma” best described as very similar to human body odor. We came across a cool internet site which you may possibly get pleasure from. Take a look if you want. ubcildvgmtt,If you are going for best contents like I do, just go to see this web page daily because it offers quality contents, thanks! The core of your writing while appearing agreeable initially, did not work perfectly with me after some time. Someplace throughout the sentences you were able to make me a believer but just for a very short while. I still have got a problem with your leaps in logic and one might do well to fill in those breaks. In the event that you actually can accomplish that, I would certainly end up being impressed. Gracias por la informacion de el post , me ha resultado interesante para mi web , espero poder utilizar, buen trabajo . What's Happening i am new to this, I stumbled upon this I've discovered It absolutely helpful and it has helped me out loads. I hope to contribute & aid other customers like its helped me. Great job. Below youll find the link to some sites that we feel you must visit. xfmrwq,Your blog was informative and valuable to me. Thanks for sharing. That would be the finish of this article. Here you will obtain some internet sites that we consider youll value, just click the links. I truly love your website.. Very nice colors & theme. Did you develop this website yourself? Please reply back as I'm wanting to create my own personal blog and would like to find out where you got this from or exactly what the theme is named. Appreciate it! We came across a cool web site that you just may possibly get pleasure from. Take a look when you want. Very handful of internet sites that come about to be detailed below, from our point of view are undoubtedly well worth checking out. pmgywfszt,Hi there, just wanted to say, I liked this article. It was helpful. Keep on posting! Greetings from Carolina! I'm bored to death at work so I decided to browse your website on my iphone during lunch break. I enjoy the knowledge you provide here and can't wait to take a look when I get home. I'm shocked at how quick your blog loaded on my cell phone .. I'm not even using WIFI, just 3G .. Anyways, amazing site! Below youll obtain the link to some websites that we think it is best to visit. Please visit the web sites we follow, like this one particular, as it represents our picks from the web. F*ckin’ amazing things here. I am very glad to see your post. Thanks a lot and i'm looking forward to contact you. Will you please drop me a e-mail? That would be the finish of this report. Right here youll locate some web sites that we assume youll value, just click the hyperlinks. There are definitely loads of details like that to take into consideration. That may be a great level to convey up. I supply the ideas above as general inspiration but clearly there are questions just like the one you deliver up the place a very powerful thing will likely be working in trustworthy good faith. I don?t know if best practices have emerged round issues like that, however I am positive that your job is clearly recognized as a good game. Both girls and boys feel the impression of just a second’s pleasure, for the remainder of their lives. Every once in a whilst we select blogs that we read. Listed below would be the most recent web sites that we pick out. yaxukv,This website truly has alll of the information and facts I wanted about this subject and didn?t know who to ask. The info mentioned inside the write-up are a few of the ideal obtainable. Great goods from you, man. I have be aware your stuff prior to and you're just too magnificent. I really like what you have bought here, certainly like what you are stating and the way through which you assert it. You're making it entertaining and you continue to take care of to keep it sensible. I cant wait to learn much more from you. This is actually a terrific web site. I don't normally comment but I gotta tell appreciate it for the post on this great one : D.
Every as soon as in a whilst we decide on blogs that we read. Listed beneath are the most current web pages that we opt for. I'm often to running a blog and i actually recognize your content. The article has really peaks my interest. I am going to bookmark your website and preserve checking for new information. Hello there, I do believe your web site might be having web browser compatibility issues. Whenever I take a look at your web site in Safari, it looks fine but when opening in Internet Explorer, it's got some overlapping issues. I simply wanted to give you a quick heads up! Apart from that, great website! Simply wish to say your article is as amazing. The clearness on your post is simply great and i can think you're an expert on this subject. Well with your permission let me to grasp your RSS feed to stay updated with drawing close post. Thanks a million and please continue the gratifying work. You need to take part in a contest for one of the finest sites on the internet. I will recommend this web site! Check below, are some totally unrelated websites to ours, on the other hand, they are most trustworthy sources that we use. I know this site offers quality based content and extra stuff, is there any other site which provides these kinds of data in quality? Hello there! This post couldn't be written much better! Reading through this article reminds me of my previous roommate! He constantly kept talking about this. I'll send this information to him. Pretty sure he's going to have a good read. Many thanks for sharing! Although internet websites we backlink to beneath are considerably not related to ours, we feel they may be in fact worth a go via, so possess a look. Valuable information. Lucky me I found your website accidentally, and I'm stunned why this coincidence didn't came about earlier! I bookmarked it. qfiqfzhi,Your blog was informative and valuable to me. Thanks for sharing. I like what you guys tend to be up too. This type of clever work and exposure! Keep up the superb works guys I've incorporated you guys to blogroll. Great post. I was checking constantly this blog and I am impressed! Very useful info specifically the last part : ) I care for such info a lot. I was looking for this particular info for a long time. Thank you and good luck. Hi my family member! I want to say that this post is amazing, great written and include almost all significant infos. I’d like to look extra posts like this . Hi my family member! I wish to say that this article is amazing, nice written and include approximately all vital infos. I'd like to peer extra posts like this. I?¦ll immediately grasp your rss feed as I can not find your e-mail subscription link or e-newsletter service. Do you have any? Please let me realize in order that I may just subscribe. Thanks. Please visit the internet sites we follow, such as this one particular, because it represents our picks from the web. My programmer is trying to persuade me to move to .net from PHP. I have always disliked the idea because of the expenses. But he's tryiong none the less. I've been using Movable-type on numerous websites for about a year and am worried about switching to another platform. I have heard fantastic things about blogengine.net. Is there a way I can transfer all my wordpress posts into it? Any kind of help would be greatly appreciated! Nice answers in return of this issue with solid arguments and telling everything regarding that. Real excellent visual appeal on this site, I'd rate it 10 10. It is perfect time to make some plans for the future and it's time to be happy. I have read this post and if I could I wish to suggest you some interesting things or tips. Perhaps you could write next articles referring to this article. I desire to read more things about it! I'm no longer certain the place you are getting your information, but great topic. I must spend some time learning more or understanding more. Thanks for great info I used to be searching for this information for my mission. I am really inspired together with your writing skills as smartly as with the format for your blog. Is this a paid subject or did you customize it your self? Either way keep up the excellent high quality writing, it's uncommon to peer a nice weblog like this one nowadays.. Wonderful story, reckoned we could combine a handful of unrelated information, nonetheless definitely really worth taking a search, whoa did 1 discover about Mid East has got additional problerms too. Thanks for the tips you have contributed here. Yet another thing I would like to mention is that computer system memory specifications generally go up along with other innovations in the engineering. For instance, when new generations of processors are made in the market, there's usually a related increase in the size calls for of both the pc memory as well as hard drive room. This is because the program operated by simply these processors will inevitably boost in power to use the new technological know-how. magnificent points altogether, you just received a new reader. What might you recommend about your post that you simply made some days in the past? Any certain? I love what you guys tend to be up too. This type of clever work and exposure! Keep up the very good works guys I've you guys to my personal blogroll. Thank you a lot for sharing this with all folks you actually recognise what you're talking approximately! Bookmarked. Please additionally discuss with my site =). We will have a link trade arrangement between us! Hmm it looks like your website ate my first comment (it was extremely long) so I guess I'll just sum it up what I submitted and say, I'm thoroughly enjoying your blog. I as well am an aspiring blog writer but I'm still new to the whole thing. Do you have any recommendations for first-time blog writers? I'd really appreciate it. Good day! I just want to give you a huge thumbs up for the excellent information you've got right here on this post. I will be returning to your blog for more soon. It's awesome to pay a visit this website and reading the views of all colleagues concerning this paragraph, while I am also zealous of getting experience. Hello i am kavin, its my first time to commenting anywhere, when i read this post i thought i could also make comment due to this good article. Good day very nice web site!! Man .. Excellent .. Superb .. I will bookmark your website and take the feeds also?KI'm satisfied to seek out numerous helpful information right here in the post, we want work out extra techniques in this regard, thank you for sharing. . . . . . Simply wish to say your article is as astounding. The clarity in your post is just great and i could assume you are an expert on this subject. Fine with your permission let me to grab your RSS feed to keep updated with forthcoming post. Thanks a million and please carry on the rewarding work. Most of the things you say happens to be supprisingly legitimate and it makes me wonder the reason why I hadn't looked at this with this light previously. This particular article really did switch the light on for me as far as this specific topic goes. Nonetheless there is 1 point I am not really too comfortable with and whilst I try to reconcile that with the actual main idea of your point, permit me see just what the rest of the visitors have to point out.Very well done. I'd constantly want to be update on new blog posts on this internet site, saved to favorites! . Thanks for any other great post. The place else may anyone get that kind of information in such an ideal way of writing? I've a presentation next week, and I am at the search for such info. Hello! I could have sworn I've visited this site before but after looking at many of the posts I realized it's new to me. Regardless, I'm definitely happy I found it and I'll be book-marking it and checking back frequently! I know this site offers quality depending content and additional stuff, is there any other web site which gives these things in quality? I precisely had to thank you very much yet again. I am not sure the things I would have achieved without these pointers documented by you directly on this problem. It previously was a real terrifying matter in my view, however , being able to see a specialized technique you managed the issue forced me to jump over happiness. Now i am grateful for the help and sincerely hope you know what an amazing job you were putting in instructing the mediocre ones with the aid of your webpage. I know that you've never got to know any of us. This is a really good tip especially to those fresh to the blogosphere. Short but very accurate information?Appreciate your sharing this one. A must read post! As the admin of this website is working, no question very rapidly it will be famous, due to its feature contents. Marvelous, what a web site it is! This weblog provides useful facts to us, keep it up. I blog frequently and I genuinely thank you for your information. Your article has truly peaked my interest. I will bookmark your blog and keep checking for new details about once a week. I subscribed to your Feed too. lqfofhf,Very informative useful, infect very precise and to the point. I’m a student a Business Education and surfing things on Google and found your website and found it very informative. Great blog post. Some tips i would like to make contributions about is that computer memory must be purchased should your computer can no longer cope with whatever you do by using it. One can deploy two RAM memory boards containing 1GB each, as an example, but not certainly one of 1GB and one with 2GB. One should look for the company's documentation for the PC to be certain what type of memory space is essential. Heya i am for the primary time here. I came across this board and I find It truly useful & it helped me out a lot. I hope to provide one thing back and help others like you aided me. What's up, after reading this remarkable piece of writing i am also glad to share my experience here with friends. I would like to show appreciation to the writer for rescuing me from this particular scenario. Right after browsing through the online world and obtaining ways that were not powerful, I believed my entire life was well over. Being alive without the answers to the difficulties you've resolved through your good report is a serious case, as well as those which could have in a negative way damaged my entire career if I had not come across your website. Your good natural talent and kindness in controlling all things was crucial. I am not sure what I would've done if I had not encountered such a solution like this. It's possible to at this time relish my future. Thanks very much for the expert and amazing help. I will not hesitate to suggest your web sites to anyone who requires recommendations about this issue. magnificent submit, very informative. I ponder why the other specialists of this sector don't notice this. You must proceed your writing. I'm sure, you have a huge readers' base already! Right here is the perfect site for anybody who would like to find out about this topic. You realize a whole lot its almost tough to argue with you (not that I actually would want to…HaHa). You certainly put a brand new spin on a subject that has been discussed for many years. Wonderful stuff, just excellent! Hello, Neat post. There is a problem together with your website in internet explorer, may check this?K IE nonetheless is the marketplace chief and a huge component of folks will pass over your fantastic writing due to this problem. Hello! I just want to give an enormous thumbs up for the good data you will have right here on this post. I shall be coming again to your blog for more soon. Have you ever thought about including a little bit more than just your articles? I mean, what you say is valuable and all. Nevertheless imagine if you added some great pictures or video clips to give your posts more, "pop"! Your content is excellent but with pics and videos, this site could definitely be one of the most beneficial in its field. Good blog! F*ckin' tremendous issues here. I am very happy to see your article. Thank you so much and i am looking forward to touch you. Will you kindly drop me a e-mail? What's up, yes this piece of writing is actually fastidious and I have learned lot of things from it concerning blogging. thanks. Thanks for your marvelous posting! I quite enjoyed reading it, you happen to be a great author. I will remember to bookmark your blog and will often come back sometime soon. I want to encourage yourself to continue your great posts, have a nice afternoon! Does your blog have a contact page? I'm having trouble locating it but, I'd like to send you an e-mail. I've got some creative ideas for your blog you might be interested in hearing. Either way, great blog and I look forward to seeing it expand over time. ontpcdrmhu,Very informative useful, infect very precise and to the point. I’m a student a Business Education and surfing things on Google and found your website and found it very informative. Excellent post. Keep writing such kind of info on your blog. Im really impressed by your site. Hi there, You've done a great job. I will certainly digg it and in my opinion suggest to my friends. I'm sure they will be benefited from this web site. I just couldn't go away your site prior to suggesting that I actually loved the standard information an individual provide for your guests? Is going to be back steadily to inspect new posts. In the grand design of things you'll receive a B- with regard to effort. Where exactly you actually confused me personally was on all the facts. You know, they say, details make or break the argument.. And it couldn't be more accurate at this point. Having said that, permit me reveal to you exactly what did work. The article (parts of it) is definitely quite engaging and that is most likely why I am making an effort to comment. I do not make it a regular habit of doing that. Secondly, whilst I can notice the jumps in reasoning you make, I am not convinced of just how you seem to connect your ideas which inturn produce the actual final result. For the moment I shall yield to your issue but wish in the near future you actually connect the dots much better. Thank you a lot for providing individuals with an extremely remarkable possiblity to discover important secrets from this website. It's always so sweet and as well , jam-packed with a great time for me and my office fellow workers to search your web site at the least thrice weekly to learn the latest items you will have. And of course, we're certainly astounded with all the amazing suggestions served by you. Certain 2 points on this page are unquestionably the finest I've ever had. Please let me know if you're looking for a article author for your site. You have some really great articles and I feel I would be a good asset. If you ever want to take some of the load off, I'd really like to write some content for your blog in exchange for a link back to mine. Please send me an email if interested. Kudos! ileddpv Yeezy 350,Waw! Its really great and wonderful ever i found. Thank you for sharing this info. I want examining and I conceive this website got some genuinely utilitarian stuff on it! . With havin so much content do you ever run into any issues of plagorism or copyright violation? My site has a lot of completely unique content I've either written myself or outsourced but it appears a lot of it is popping it up all over the web without my permission. Do you know any methods to help protect against content from being stolen? I'd certainly appreciate it. Very good information. Lucky me I came across your website by chance (stumbleupon). I've saved as a favorite for later! Rattling instructive and great anatomical structure of content, now that's user genial (:. I just want to say I am just beginner to blogging and definitely enjoyed your page. More than likely I’m want to bookmark your site . You surely come with great well written articles. Thanks for sharing your webpage. I've been surfing on-line greater than 3 hours as of late, but I by no means discovered any fascinating article like yours. It is lovely worth enough for me. Personally, if all web owners and bloggers made good content material as you did, the internet will probably be a lot more useful than ever before. Useful information. Lucky me I discovered your site by accident, and I am stunned why this twist of fate didn't happened earlier! I bookmarked it. What I have observed in terms of laptop or computer memory is the fact that there are features such as SDRAM, DDR and so forth, that must fit in with the specs of the mother board. If the pc's motherboard is rather current while there are no operating-system issues, modernizing the memory literally normally requires under an hour. It's one of several easiest pc upgrade types of procedures one can consider. Thanks for giving your ideas. You're so interesting! I do not think I have read through a single thing like this before. So wonderful to discover someone with genuine thoughts on this subject matter. Seriously.. thanks for starting this up. This website is something that's needed on the internet, someone with a little originality! Hi there! This is my first comment here so I just wanted to give a quick shout out and say I genuinely enjoy reading your posts. Can you suggest any other blogs/websites/forums that go over the same subjects? Thanks! Hiya very cool web site!! Man .. Excellent .. Superb .. I'll bookmark your website and take the feeds alsoKI am happy to seek out numerous helpful info here in the put up, we need develop extra techniques in this regard, thank you for sharing. . . . . .
On the off chance that you can apply all of what you have seen truly, you can genuinely spare some central bucks for yourself. @Mary - I agree that it would make things a little messier, but the majority of people I have spoken to reckon it is often worth doing. What¦s Happening i'm new to this, I stumbled upon this I have discovered It positively useful and it has helped me out loads. I'm hoping to give a contribution & assist other users like its helped me. Good job. I just want to say I am very new to blogging and site-building and actually enjoyed you're blog site. Probably I’m likely to bookmark your site . You really come with fabulous articles and reviews. Thanks a bunch for revealing your website page. The subsequent time I read a weblog, I hope that it doesnt disappoint me as a lot as this one. I mean, I know it was my option to learn, but I actually thought youd have something fascinating to say. All I hear is a bunch of whining about one thing that you can fix when you werent too busy searching for attention. It's appropriate time to make some plans for the future and it's time to be happy. I've learn this publish and if I may I desire to suggest you some fascinating issues or tips. Perhaps you can write next articles referring to this article. I wish to read even more things approximately it! Greetings from Ohio! I'm bored at work so I decided to browse your website on my iphone during lunch break. I love the information you present here and can't wait to take a look when I get home. I'm amazed at how fast your blog loaded on my cell phone .. I'm not even using WIFI, just 3G .. Anyways, great site! First of all I want to say awesome blog! I had a quick question in which I'd like to ask if you do not mind. I was interested to know how you center yourself and clear your head prior to writing. I have had a difficult time clearing my thoughts in getting my ideas out. I do take pleasure in writing however it just seems like the first 10 to 15 minutes are lost simply just trying to figure out how to begin. Any recommendations or tips? Kudos! Your means of describing all in this article is actually good, every one be able to easily be aware of it, Thanks a lot. Hiya! I know this is kinda off topic but I'd figured I'd ask. Would you be interested in exchanging links or maybe guest writing a blog post or vice-versa? My blog goes over a lot of the same subjects as yours and I believe we could greatly benefit from each other. If you happen to be interested feel free to send me an e-mail. I look forward to hearing from you! Terrific blog by the way! Hi, Neat post. There's an issue together with your web site in web explorer, would check this?K IE nonetheless is the marketplace chief and a big part of people will pass over your great writing due to this problem. What's up to all, how is the whole thing, I think every one is getting more from this web page, and your views are nice in favor of new people. It's the best time to make some plans for the future and it is time to be happy. I've read this post and if I could I wish to suggest you few interesting things or suggestions. Perhaps you can write next articles referring to this article. I want to read even more things about it! Hi there to every one, the contents present at this web site are actually awesome for people knowledge, well, keep up the good work fellows. Heya i'm for the first time here. I found this board and I in finding It truly useful & it helped me out much. I hope to offer something back and aid others like you aided me. You actually make it seem really easy along with your presentation however I to find this topic to be actually something that I believe I would by no means understand. It kind of feels too complicated and very vast for me. I'm taking a look ahead in your next put up, I will try to get the dangle of it! Amazing issues here. I am very glad to peer your article. Thanks a lot and I am looking forward to touch you. Will you please drop me a e-mail? My spouse and I absolutely love your blog and find many of your post's to be precisely what I'm looking for. can you offer guest writers to write content available for you? I wouldn't mind writing a post or elaborating on a number of the subjects you write about here. Again, awesome site! It's remarkable to visit this web page and reading the views of all colleagues regarding this article, while I am also keen of getting knowledge. Really nice style and design and good articles, absolutely nothing else we want : D.
Good response in return of this query with solid arguments and telling the whole thing about that. I all the time emailed this weblog post page to all my friends, for the reason that if like to read it after that my friends will too. I have been exploring for a little for any high-quality articles or weblog posts on this kind of area . Exploring in Yahoo I eventually stumbled upon this web site. Reading this info So i'm satisfied to exhibit that I've a very good uncanny feeling I discovered just what I needed. I so much without a doubt will make certain to don?t overlook this site and give it a look regularly. Thanks for your posting on this web site. From my own personal experience, often times softening right up a photograph may possibly provide the wedding photographer with a little bit of an creative flare. More often than not however, this soft blur isn't precisely what you had in your mind and can usually spoil an otherwise good photo, especially if you intend on enlarging the item. I have observed that in the world of today, video games include the latest trend with children of all ages. Occasionally it may be difficult to drag your son or daughter away from the video games. If you want the best of both worlds, there are various educational gaming activities for kids. Thanks for your post. I read this piece of writing completely concerning the resemblance of most up-to-date and earlier technologies, it's remarkable article. you're actually a good webmaster. The site loading speed is amazing. It kind of feels that you're doing any distinctive trick. Furthermore, The contents are masterpiece. you have performed a wonderful task in this subject! Your style is very unique compared to other folks I've read stuff from. Thanks for posting when you've got the opportunity, Guess I will just bookmark this page. Heya i'm for the primary time here. I found this board and I in finding It truly helpful & it helped me out much. I'm hoping to give something again and help others such as you helped me. Magnificent website. Lots of useful information here. I'm sending it to some pals ans also sharing in delicious. And naturally, thank you in your effort! Fantastic goods from you, man. I have understand your stuff previous to and you are just extremely excellent. I really like what you've acquired here, really like what you are stating and the way in which you say it. You make it entertaining and you still care for to keep it smart. I cant wait to read much more from you. This is actually a wonderful website. I don't even know the way I stopped up here, however I believed this publish used to be great. I don't recognise who you are however certainly you're going to a famous blogger when you aren't already. Cheers! Hello! I simply want to offer you a big thumbs up for your excellent info you've got right here on this post. I'll be returning to your web site for more soon. My relatives all the time say that I am wasting my time here at web, but I know I am getting experience everyday by reading such good articles. I have been browsing online more than 4 hours today, yet I never found any interesting article like yours. It's pretty worth enough for me. In my view, if all web owners and bloggers made good content as you did, the internet will be a lot more useful than ever before. I went over this site and I conceive you have a lot of good info , saved to favorites (:. Hey would you mind letting me know which webhost you're using? I've loaded your blog in 3 completely different internet browsers and I must say this blog loads a lot quicker then most. Can you recommend a good internet hosting provider at a honest price? Thank you, I appreciate it! Hi there! This article could not be written any better! Going through this article reminds me of my previous roommate! He continually kept preaching about this. I am going to forward this post to him. Pretty sure he'll have a great read. Many thanks for sharing! Spot on with this write-up, I truly believe this web site needs a great deal more attention. I'll probably be back again to read more, thanks for the information! Hi, i think that i saw you visited my site thus i came to “return the favor”.I'm trying to find things to enhance my web site!I suppose its ok to use a few of your ideas!! Do you mind if I quote a few of your articles as long as I provide credit and sources back to your website? My blog is in the very same niche as yours and my visitors would really benefit from a lot of the information you provide here. Please let me know if this alright with you. Thanks a lot! Wonderful post however , I was wanting to know if you could write a litte more on this topic? I'd be very grateful if you could elaborate a little bit further. Bless you! Hello there! I know this is kinda off topic however I'd figured I'd ask. Would you be interested in exchanging links or maybe guest writing a blog article or vice-versa? My blog goes over a lot of the same subjects as yours and I think we could greatly benefit from each other. If you happen to be interested feel free to shoot me an e-mail. I look forward to hearing from you! Awesome blog by the way! Hi there! Quick question that's completely off topic. Do you know how to make your site mobile friendly? My weblog looks weird when viewing from my apple iphone. I'm trying to find a template or plugin that might be able to fix this issue. If you have any suggestions, please share. With thanks! Great post. I was checking constantly this blog and I'm impressed! Very useful information specially the last part : ) I care for such information much. I was looking for this particular information for a long time. Thank you and good luck. I loved as much as you'll receive carried out right here. The sketch is tasteful, your authored subject matter stylish. nonetheless, you command get got an impatience over that you wish be delivering the following. unwell unquestionably come more formerly again as exactly the same nearly a lot often inside case you shield this hike. I am really enjoying the theme/design of your weblog. Do you ever run into any web browser compatibility problems? A number of my blog visitors have complained about my website not working correctly in Explorer but looks great in Chrome. Do you have any ideas to help fix this issue? great issues altogether, you simply received a new reader. What would you suggest in regards to your post that you made a few days in the past? Any certain? the more i read your post, i feel you've done a very good job with this. Greetings from Ohio! I'm bored at work so I decided to browse your website on my iphone during lunch break. I enjoy the info you provide here and can't wait to take a look when I get home. I'm surprised at how fast your blog loaded on my phone .. I'm not even using WIFI, just 3G .. Anyways, superb site! That will be the end of this write-up. Right here you will discover some web sites that we assume you will value, just click the hyperlinks. I’ll right away grab your rss feed as I can't find your email subscription link or e-newsletter service. Do you have any? Please let me know so that I could subscribe. Thanks. Hey there! I'm at work browsing your blog from my new apple iphone! Just wanted to say I love reading your blog and look forward to all your posts! Carry on the excellent work! Thanks for another informative site. Where else could I am getting that kind of info written in such an ideal method? I've a project that I am just now running on, and I have been on the look out for such information. Hi there, I found your blog by means of Google at the same time as searching for a similar subject, your site came up, it appears great. I've bookmarked it in my google bookmarks. Really when someone doesn't know afterward its up to other users that they will help, so here it occurs. I've been absent for a while, but now I remember why I used to love this website. Thanks, I'll try and check back more often. How frequently you update your web site? Thanks for ones marvelous posting! I really enjoyed reading it, you can be a great author.I will make certain to bookmark your blog and will come back later on. I want to encourage one to continue your great work, have a nice afternoon! I was extremely pleased to discover this website. I want to to thank you for ones time for this fantastic read!! I definitely savored every bit of it and I have you book marked to check out new things in your blog. Next time I read a blog, I hope that it doesn't fail me just as much as this particular one. I mean, I know it was my choice to read, nonetheless I actually thought you'd have something helpful to say. All I hear is a bunch of complaining about something you could fix if you were not too busy seeking attention. May I simply say what a relief to discover someone that genuinely understands what they're discussing over the internet. You definitely know how to bring a problem to light and make it important. More people should read this and understand this side of your story. It's surprising you're not more popular since you most certainly possess the gift. few fascinating things or suggestions. I have actually been a yahoo individuals for some years now. I am only starting to take advantage of the tools which they supply, one of which being article. I have actually composed a blog and wants to recognize if my post are being seen by others. Otherwise after that does any individual know exactly how I get my blogs posts review. I don't even understand how I finished up here, however I believed this put up used to be great. I do not recognize who you might be but definitely you are going to a famous blogger when you are not already. Cheers! If some one desires to be updated with latest technologies after that he must be pay a quick visit this site and be up to date every day. It's going to be finish of mine day, except before ending I am reading this impressive post to improve my experience. It's the best time to make some plans for the future and it is time to be happy. I've read this post and if I could I want to suggest you some interesting things or suggestions. Maybe you can write next articles referring to this article. I wish to read more things about it! A person essentially assist to make significantly posts I would state. This is the first time I frequented your website page and to this point? I surprised with the research you made to make this actual submit extraordinary. Wonderful activity! The next time I read a blog, Hopefully it doesn't disappoint me as much as this one. I mean, I know it was my choice to read, but I actually believed you would probably have something interesting to say. All I hear is a bunch of whining about something you could fix if you weren't too busy looking for attention. Below you will discover the link to some web sites that we think you need to visit. It is appropriate time to make some plans for the future and it is time to be happy. I've read this post and if I could I wish to suggest you few interesting things or advice. Perhaps you could write next articles referring to this article. I want to read even more things about it! Have you ever considered about including a little bit more than just your articles? I mean, what you say is valuable and everything. However think of if you added some great images or video clips to give your posts more, "pop"! Your content is excellent but with images and video clips, this blog could definitely be one of the greatest in its field. Superb blog! Wonderful website. Lots of helpful information here. I?¦m sending it to several friends ans also sharing in delicious. And naturally, thanks in your effort! I like the valuable information you provide in your articles. I’ll bookmark your weblog and check again here frequently. I'm quite sure I’ll learn many new stuff right here! Best of luck for the next! What's up i am kavin, its my first occasion to commenting anyplace, when i read this post i thought i could also make comment due to this sensible article. Hello my family member! I want to say that this post is amazing, nice written and come with almost all important infos. I'd like to peer more posts like this . you are truly a just right webmaster. The web site loading pace is incredible. It kind of feels that you're doing any distinctive trick. In addition, The contents are masterwork. you have performed a great job on this matter! I'm really inspired together with your writing talents as neatly as with the layout on your blog. Is that this a paid subject or did you modify it your self? Either way keep up the excellent quality writing, it is rare to see a nice blog like this one nowadays..
First off I would like to say superb blog! I had a quick question which I'd like to ask if you don't mind. I was curious to know how you center yourself and clear your head before writing. I've had a difficult time clearing my mind in getting my thoughts out there. I do enjoy writing however it just seems like the first 10 to 15 minutes tend to be lost just trying to figure out how to begin. Any recommendations or tips? Thank you! Somebody essentially lend a hand to make critically posts I'd state. That is the first time I frequented your website page and up to now? I surprised with the analysis you made to make this particular submit extraordinary. Excellent activity! What i don't understood is in truth how you're now not really much more smartly-liked than you might be right now. You are very intelligent. You already know thus significantly relating to this subject, produced me in my opinion believe it from so many numerous angles. Its like women and men are not involved except it is one thing to accomplish with Woman gaga! Your own stuffs great. At all times handle it up! LIBgFs this subject and didn at know who to ask. certainly like your website but you need to check the spelling on quite a few of your posts. A number of them are rife with spelling issues and I find it very troublesome to tell the truth nevertheless I will definitely come back again. Link exchange is nothing else however it is only placing the other person's blog link on your page at appropriate place and other person will also do same in support of you. Simply got a Blog writer account, it functions excellent, yet just how do I discover different individuals blogs I such as with search. I bear in mind there is a means, but I am not seeing it currently. Thanks for your aid. I conceive this website has got some very wonderful information for everyone : D.